Though we're all busy bees 365 days a year, 'tis the season to burn the midnight oil. Whether you're up late working to meet that last-minute project deadline or simply making it a personal mission to actually attend each and every one of your holiday parties this year (we salute you), the impact can be draining. Sleep is important, after all, and when we're not getting enough of it, it's all too easy to become irritable, impatient, unproductive, and—let's face it—just plain old miserable. And while we can advocate for the benefits of sleep until we're blue in the face, we won't lie: Staying faithful to a full eight hours is hard and, realistically, not always in the cards (especially this time of year). Thus, it's important to have some tricks up our sleeves to nurture our depleted energy levels (preferably that won't increase our dependency on caffeine or sugar). So we were curious—what about essential oils for energy? We're already infatuated with them for moisturizing our cactus-like skin, helping us to drift blissfully off to sleep, and even clearing up our acne. So is it too much to ask that they also perk us up around 3 p.m. when we feel like we've been run over by a truck and simply can't go on? According to Sara Panton, co-founder of Vitruvi (a super-obsession-worthy line of essential oils and diffusers created by and for millennial women—so cool), not in the least. Apparently, essential oils can do wonderful things for our energy while simultaneously supplementing happiness, stress reduction, and overall well-being along the way. Cool, right? "I love anything citrus for an energy kick. I usually turn to scents like grapefruit and bergamot as well as fresh and herbaceous essential oils like peppermint and eucalyptus," she explains. And really, that's just the tip of the iceberg. It's part of Vitruvi's mission to encourage women to take advantage of the small moments throughout our day for the sake of a little slice of indulgence (so we can take on the world like our badass selves, obviously). The brand's ultimate goal: to help you take care of yourself so you can take on the world. In addition to being a creative and innovative CEO, Panton's also a total scent whisperer, and we couldn't wait to pepper her with all the questions about essential oils for energy. 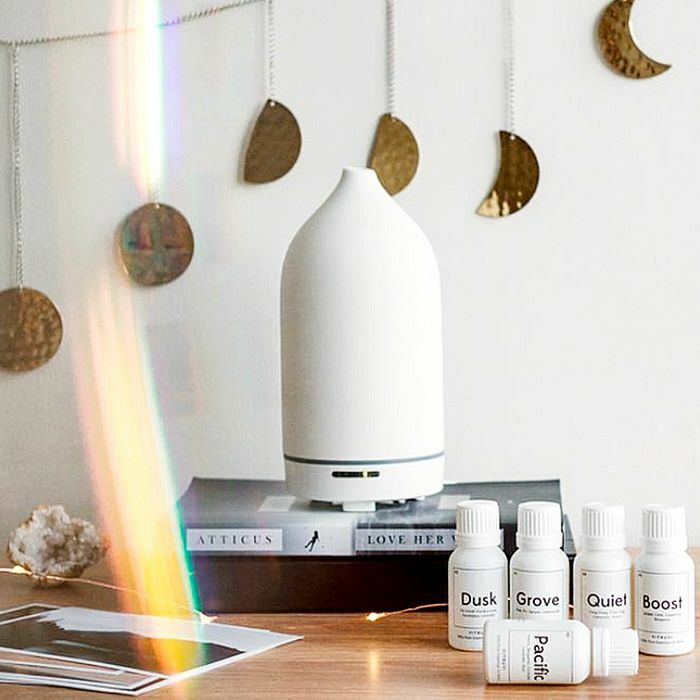 Below, you'll find seven of her go-to oils, three top-secret hacks for a dreamier workday, and last, but certainly not least, three heavenly blend ideas for those in need of some inspiration—or who simply don't speak aromatherapy (ahem, me)—keep reading! When it comes to essential oils for energy, there are a couple different scent families you can focus on: citrusy fare like grapefruit, sweet orange, and lemon, or more herbaceous base notes like eucalyptus, peppermint, rosemary, and lemongrass. However, even within these specific groupings, Panton recommends certain oils over others. Here, she gives us the inside scoop on her personal favorites and how strategically using these particular essential oils can improve our energy levels. Keep scrolling for Panton's expert tips, hacks, and blends for incorporating them into your everyday routine. If you add a handful of Cedarwood Essential Oil ($10) drops to your diffuser as you get ready in the morning, you're already halfway there. However, Panton revealed to us there's an even dreamier way to start your day off on the right foot—aka transform your bathroom into the heavenly likes of a rejuvenizing cedar sauna. "Try adding three drops of cedarwood oil to the palm of your hands while you're in the shower. Rub your hands together and allow the aroma to release and turn your morning shower into a cedar ritual that smells like a cedar sauna spa experience," she says. And—in case your alchemic proclivities are curious—the oil pairs lusciously with eucalyptus, spruce, and lavender. Although we have to admit we're partial to this one straight-up. "Add two to three drops of peppermint essential oil to your regular morning shampoo and conditioner to stimulate the scalp, energize your mind, and wake up naturally," she explains. We love the invigorating scent of grapefruit, so it didn't come as a huge shock when Panton suggested it as one of the best essential oils for energy levels. What did take us by surprise? This super-cool hack to energize our skincare routine. "Add four drops of grapefruit essential oil to your existing moisturizer or add four drops to one tablespoon of jojoba oil for a brightening and completely natural face oil that will create a fresh glow," she says. We're not sure how Panton knew about our obsession with jojoba oil in the name of eternal radiance, but in any case, we always keep this 100% natural and 99% organic pick from Ogee within arm's reach. Below, Panton shares her go-to mixtures for energy—a helpful guide for anyone new to mixing and unsure where to start! Simply add to your diffuser, breathe deep, and go get 'em. Six drops bergamot + six drops cedarwood = a cozy yet energizing afternoon diffuser blend at your desk. Ten drops eucalyptus + 10 drops sweet orange + two inches of warm water in your bathtub = a revitalizing foot soak to help reset and refresh after a long day on your feet. Three drops grapefruit + two drops geranium + two pumps of your morning moisturizer = a fresh way to boost and energize your daily skincare routine. Next up: the surprising healing benefits of amethysts, according to an intuitive energy healer.